The Minicom Digital Signage manufactured by Kramer Electronics DSV3K-RS is a short range (110m/360ft) receiver unit for the DS Vision 3000 digital signage solution. 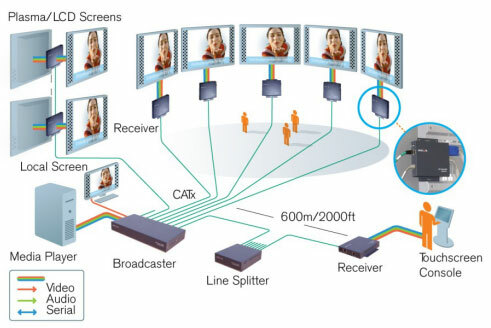 The DS Vision 3000 broadcasts high-definition video and stereo-audio from a single player, over CATx cable, to multiple plasma/LCD screens located up to 600m/2000ft away. Combined with full serial command, the DS Vision 3000 is the ultimate solution for controlling and delivering real-time multimedia content. This digital signage solution is a modular system, made up of units that can be exactly molded to your network requirements without superfluous hardware. The result is a digital signage network streamlined in function and cost-effective on budget. The Minicom DS Vision system features full RS-232 bidirectional communication, which gives you the ability to remotely query screen operation time - essential for monitoring the remaining life of your screens and a valuable precursor to measuring advertising effectiveness. The DS system also enables power commands that turn either the entire screen network or screen groups on/off. Screen wear and tear is thus minimized while maximizing the life of your digital signage network. With extended range, DS Vision 3000 gives you the freedom to set-up your LCD/plasma screens at any desired location, without fear of compromising your media quality and safe in the knowledge that your media player is out of sight and out of unauthorized hands. Whether multiple-screen timetables and advertisements, or single-screen bulletins, signs and training aids, the DS Vision 3000 system delivers your message, picture perfect, every time. System Range - 600m (2000ft). Bidirectional RS-232 Control - Enables remote screen control (query & power). Service Utility - For easy setup and maintenance. Open Protocol - For CMS integration. Dimensions 5.78 x 5.70 x 1 in. Frequency Response 20Hz to 20kHz, +/−1dB. Line Level Output Supports multimedia speakers. Question: Can you advise if this is the DS vision 3000 long and if you ship to Ireland please? Looking for total cost in euro please? Answer: Thank you for your inquiry. This is one component of the DS vision 30o0 System, The rest of the items in the family can be found here: https://www.kvm-switches-online.com/minicom-ds-vision.html. Unfortunately, we are not shipping internationally at this time. Please visit Kramer Electronics to locate a a distributor in your area. http://www.kramerelectronics.com/dealers.asp.